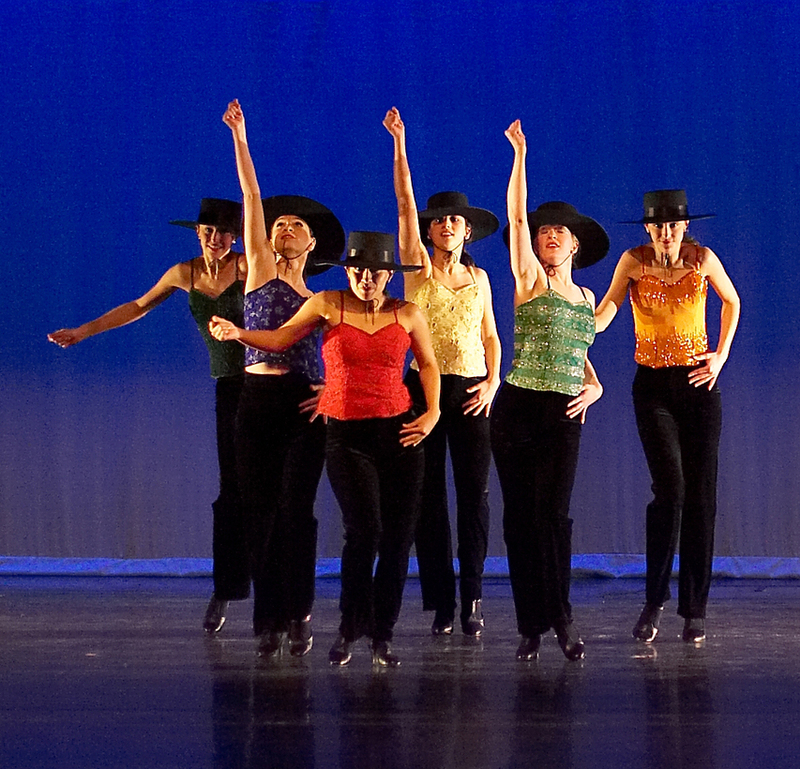 Each year Dancin’ Unlimited welcomes new dancers from other parts of the country – Ohio, Pennsylvania, Connecticut, Florida, and more. We recently asked them what it’s like to audition, move to Northern Virginia and learn to live in a new area. Two Company members that have been with Dancin’ Unlimited for several years are Ashley from Baltimore and Laura from Wisconsin. Jessi from Florida and Melissa from Maryland are the newest members of the Company. How did you hear about Dancin’ Unlimited Jazz Dance Company? Ashley:I heard about Dancin Unlimited by looking for dance companies in the Maryland/Virginia/DC area, and I contacted Alan, the President, for more information about the company. Laura: I learned about Dancin’ Unlimited from a friend of mine in college (Oklahoma City University). She had auditioned for the company and when we talked on the phone after her audition she told me that I should give it a try. So I flew out here, auditioned, and decided to join. Jessi: I initially discovered Dancin’ Unlimited on the website Answers4Dancers. They have compiled a huge list of dance companies around the country and during my last semester of college I read the entire list, doing more research into the companies I thought might be a good fit. DUJDC came back on my radar in the fall when I saw a posting on the same website for an upcoming audition. Melissa: In High School I was an apprentice in a professional company, Motion Mania Dance Theatre. I had the opportunity to perform in the Jazz & Tap Dance Festival, which Dancin’ Unlimited produced. Some of the dancers I knew in Motion Mania had also been a part of Dancin’ Unlimited in the past. I saw the company perform and really loved their style and energy. After graduating from James Madison University, I researched Dancin’ Unlimited more and decided to audition. Ashley: The audition process for me was not as challenging as some of the auditions that I have been to in NYC or Florida, but it was a great audition and very organized. I thought that the audition was comprehensive. It provided what Marilyn, the Artistic Director, needed to see in a dancer in such a short amount of time. Laura: For the audition, I remember I was nervous because I didn’t know what to expect. My friend had told me that Marilyn was very interested in dancers having good technique, so during the entire audition I was constantly thinking about my technique and alignment. It must’ve worked! Jessi: Marilyn York, the Director, allowed me to submit a video reel along with my head shot and resume, to be sure that traveling from Florida for the audition would be worthwhile. From those submissions, she surprised me and offered me a place in the company! I think I was in shock for several days after receiving the offer because it was so far from anything I expected. Melissa:My audition process for this company was very different from other auditions I have been to and I enjoyed it so much more. In most auditions you have a short amount of time to show your technique, personality, and stage presence. Sometimes you learn specific choreography; but other times you are given phrases of movement that are solely based on technique. You have to quickly impress your viewers. However, I was given the opportunity to participate in one of the company’s rehearsals. In doing so, I had several hours to be viewed by the artistic director and I was able to learn actual repertoire from the company. Through my experiences in college I have worked with many different artists in rehearsal type settings. I love learning different styles of movement, so this was very fun for me. I enjoyed being able to jump right in with the other dancers and audition in a more laid back environment. Additionally, I sent a video of a solo I choreographed in a different style of movement to the director, and then I was accepted onto the company. What were the challenges of moving to the DC area? Ashley: I actually commute from Baltimore (usually a one hour drive), so the biggest challenge for me is always tons of traffic for Friday evening rehearsals. Sundays are not bad. I am glad that I can manage the driving, but rush hour traffic is a lot of frustration. It’s more convenient to live in Northern Virginia. Laura: I faced a lot of challenges moving here. I wasn’t able to fly back out here to look at apartments before moving and I didn’t know the area at all. Alan was a huge help in helping me find an apartment. He told me what cities to look in and basically guided me every step of the way. After I moved here, I wanted to teach at studios in the area and Alan emailed me business cards of different studio owners. I contacted several of them and ended up teaching at 3 different studios. I am so grateful to him and all his help! He made my transition to the area so much easier! My other challenge in assimilating to the area was figuring out traffic. I come from a small town in Wisconsin where traffic jams are only started by farm tractors heading to their fields. Even when I lived in Oklahoma during college, I lived on campus and didn’t have to deal with the traffic. I was very glad that I took the risk to move out here. It was tough to leave my family and friends behind but I think it was worth it. Jessi: Moving to DC was challenging because I had no family and very few friends in the area upon my arrival, but I had arranged to stay for awhile with family friends. The traffic, confusing streets, and changing weather seasons were new experiences for me. It was a lot to take in all at once, essentially on my own with learning to navigate a completely new place. It has been challenging to find community and start to build friendships here, but the Lord has provided in such incredible ways since I took this leap out of my comfort zone. It’s definitely been an adventure. Melissa: When I first began, I was living in Maryland and had been commuting to Fairfax and Lorton, Virginia, where the company rehearses. I now live in the Virginia area which has made my commute to weekly rehearsals much easier. A major challenge of moving was finding an affordable apartment, since I am still a student working to become a licensed dance teacher in the school systems. However, Jessi and I got together and are splitting the cost of an apartment we share, which really helped both of us. What do you like about DUJDC? Ashley: Some of the things that I love about the company are that I got a chance to meet some talented and amazing group of dancers, to learn not only choreography from one person but multiple choreographers and difference styles, not just JAZZ! Also throughout the two years that I have been with the company, we have performed several times a year. One of the best times was Artscape Baltimore! Laura: Performing. We did a lot of performances last year and I would still like to do even more. Dance has been a part of my life since childhood. I went to college to pursue dance and graduated with a BS in American Dance Pedagogy from Oklahoma City University. I’m thankful that I have the opportunity to continue to perform and teach. Jessi: DUJDC first caught my eye during that research binge of last spring mostly because it is a JAZZ company–there just aren’t that many of those around. And coming from a background so rooted in classical ballet, I appreciate the emphasis the company places on technique. The overall environment of DU has been an immense blessing as well. It’s rare in the performing arts world to find directors and fellow performers who are so supportive and encouraging of one another. Getting to know everyone has been wonderful and from my very first rehearsal, I felt so welcomed. Plus, the choreography I have learned so far in the few months I’ve been with the company has been a blast! It’s a style I love and a challenge I welcome, learning all the intricacies and subtle differences that exist within the genre of jazz dance. I find the work of dance preservation to be fascinating as well. It formed the cornerstone of my thesis work at Elon University, and so it’s exciting to me to be able to learn and perform pieces like Primo (choreographed by Joe Orlando for the Company). In order to understand where dance is going, it’s essential for audiences and performers alike to see where it has been. Melissa: One thing I love about DUJDC is the support I have received from the other company members. I began working with the company in late December and had my first performance in January. I had to quickly learn four pieces for the show and I felt a little overwhelmed at the beginning; but everyone was so encouraging and helpful. Sometimes in dance you come across a lot of competitiveness between dancers, but I have never felt this in any of my rehearsals with the company. It is clear that we are all a team and there is mutual respect for one another. I feel extremely blessed to share the stage with these talented dancers and I am appreciative of how welcoming they have been towards me. Additionally, I wanted to be a part of this company because it is a jazz company. DUJDC does an excellent job of including a wide array of styles and interpretations of jazz dance in their repertoire. Every piece I have learned is very different and has something unique to offer.